It is time for the annual YHS Hydrodrinks event again! 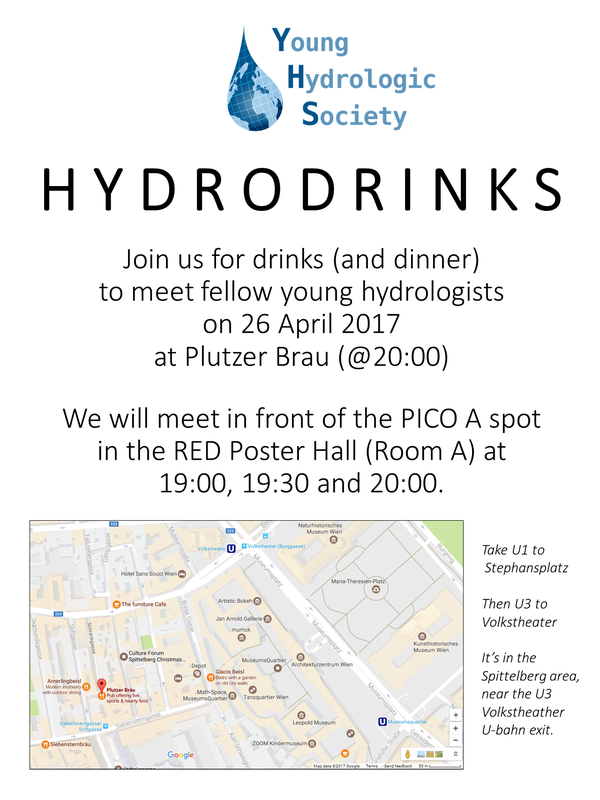 On Wednesday 26 March YHS invites all young hydrologists (and everyone that feels young and/or hydrologist) to have dinner and drinks with us. We have a reservation at PLUTZER BRÄU (http://www.plutzerbraeu.at/) at 20.00. It’s in the Spittelberg area, near the U3 Volkstheather U-bahn exit. YHS will meet in front of the PICO A spot in the RED Poster Hall (Room A) at 19:00, 19:30 (and for late comers at 20:00). Or you can meet us directly at the PLUTZER BRAU at 20:00. See the attached flyer for info. Follow @YoungHydrology on twitter or YHS on Facebook to stay updated about the plans, and feel free to contact us if you have any questions! See you tonight!